Thanks to all of our supporters who parked with us for the 2017 Football Season! It was a wonderful and successful Fall of parking and your support is going towards funding missions and retreats for our students. Thank you! We will be contacting 2017 season parking pass holders about renewing their passes for the 2018 season in the summer of 2018, so look for an email then. For all those who did not have season passes in 2017 but are interested in purchasing season parking passes for the 2018 season, check back at this page periodically in the summer for updates on parking passes becoming available. For any further questions, please contact us via email or our office phone. Football Gameday Parking at the Wesley supports the mission and operations of the Wesley. We are excited about a new football season approaching as we get ready to welcome the SEC’s best fans to Tiger Stadium. With every season comes the hassle of finding a safe and accessible place to park the car for a festive game day. The Wesley Foundation at LSU has a great location just outside the north gates of LSU’s campus that provides easy access to the stadium. 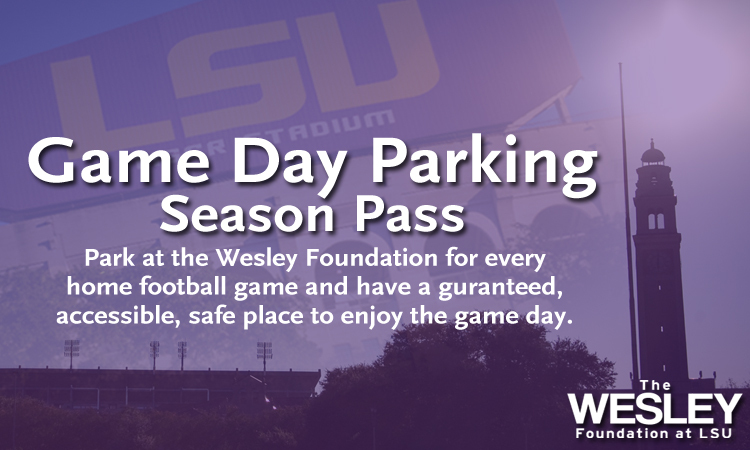 With plenty of space, access to bathrooms, and secure lighting, the Wesley Foundation is a great place to park for game day all season long. As well as purchasing a parking place each Saturday, you will be helping support the ministry with students of the Wesley Foundation at LSU.